Anyone who can name that song gets a cookie, and no Googling. I'll know. First of all, thanks to all the people sending kind words about my grandma. She’s doing fine right now, but she’s having to live in an assisted living facility while they treat her bacterial infection in her heart, and knowing her, she probably can’t stand it. But on the bright side(? ), they can’t do the open heart until she’s over the infection, so that might be a while. Anyway. 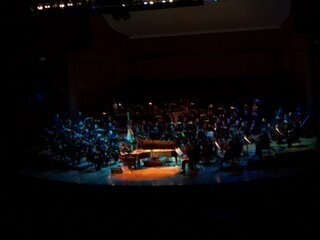 So my friend Jessica (who shall be henceforth known as Jess’ca) and I saw Ben Folds playing with the Baltimore Symphony Orchestra Saturday. It was quite amazing. Incidentally, Olivia (the other intern at the Examiner, who shall hence forth be known as O-Fess) and one of her friends were also going, so we all rode together. Truth be told, I was in a horrendous mood when we got there because getting from D.C. to Baltimore is more complicated than it should be, so we were late and I felt incredibly guilty. But from what I can tell we only missed a few songs and none of the good ones, in as much as Ben Folds has any songs that aren't good. I could tell that Ben wasn't used to playing with the Orchestra and vice versa because, especially in the more up-tempo songs, they would miss a lot of downbeats and complicated rhythms that were supposed to be in unison weren’t, but that’s probably just my band nerdiness talking. The orchestra was much better suited for the slower songs, and they played them wonderfully. 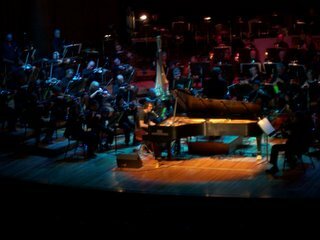 My favorite was ‘Evaporated.’ There was this intricate orchestral introduction and it was hard to tell what the song was going to be, but then the orchestra led right into the piano part and dropped off completely while Ben playing it. It’s hard to explain literally, but musically it was incredible. The album version of the song already has a string section, but there was something different about the full orchestra. If you listen to the song, there’s a little piano break after each chorus, and on the last one the violins played it along with the piano. Again, hard to explain literally, but it blew my mind. It’s one of those simple musical things that has a big impact. I cried, and I’m not ashamed to admit it. Well, maybe a little. Another great arrangement was “Boxing,” but it felt a little rushed and I think it would’ve been even better if it’d gone a little slower. But again, might just be my inner band nerd talking. I also thoroughly enjoyed “Landed.” There’s an orchestral arrangement of the song on the special edition of the Songs for Silverman album, but it didn’t make the ‘normal’ album, and I think for good reason. First of all, the arrangement wasn’t as good as the one in concert, and the mixing is done in such a way so as to drown out the lyrics. It just doesn’t flow like it should. But anyway. Other good arrangements included “Stephen’s Last Night” and “Army,” although the audience kinda drowned out the orchestra during the horn break in “Army,” which in its own way was cool. 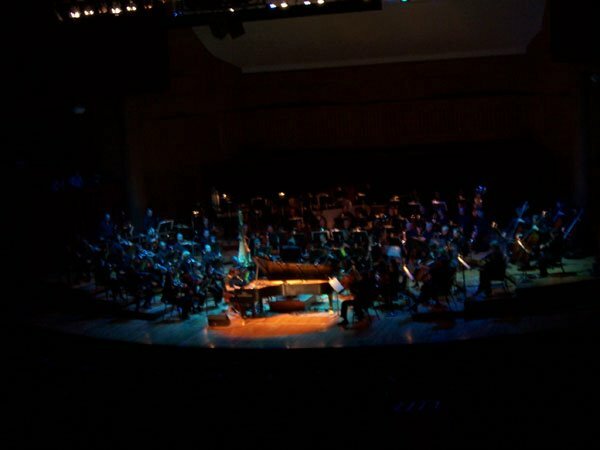 “Narcolepsy” was probably my favorite orchestral arrangement as it involved an operatic singer for all the backup singing — gave it a real Don Giovanni/Stone Guest feel. I dug it. “Not the Same” was done sans orchestra, which was nice because it reminded me of the Ben Folds shows of yore, but it still would’ve been nice to hear how he thought it should sound with a cello or two. The encore of the show was “The Luckiest,” and again, I got all weepy like a little girl. It was a strange encore because it was such a ‘downer.’ It’s a fantastic song and all, believe me — it’s one of my favorites, but when it’s the last one of the night, you leave your seat a little bummed. At least I did. As much as I enjoyed the show and as much as it was musically phenomenal and incredible and everything else, it wasn’t my favorite. I think my first Ben Folds show spoiled me. There’s something about leaning against the stage and watching him do a three hour set while explaining the meanings of the songs and talking to the audience in between... There’s also something about the emotion involved when there’s just one person on stage playing the hell out of their instrument, and it’s a little hard to get that with an entire orchestra behind you. 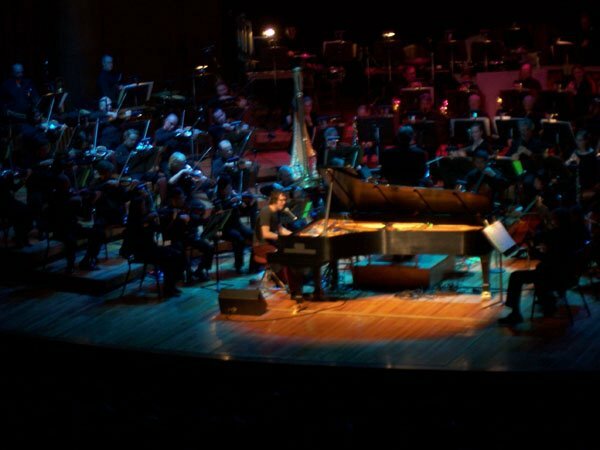 But at any rate, it was definitely the second most incredible Ben Folds show I’ve ever seen. 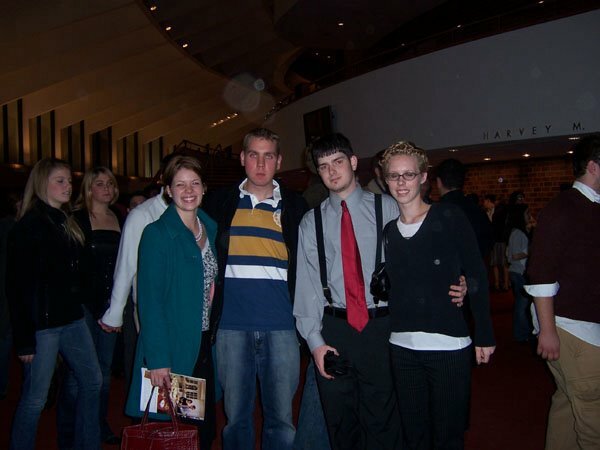 Below you’ll see a picture of O-Fess, Dave, me, and Jess’ca after the show. I also got some sweet video, but shhh don’t tell anyone. So glad everything's progressing fine with your grandma...prayers are still with her.